Jean Pierre Schenk’s Metamorphosis project has been compared a lot to Pink Floyd. Now I haven’t actually heard Metamorphosis’ first album, but Nobody Cares, their second, reminds me more of Eloy from their spacey, symphonic periods. Now this is a good thing, if you’re an Eloy fan, like I am. Schenk’s vocals even sound a bit like Frank Bornemann’s, especially on the opening cut Looking For Someone, the title track, and the 13-minute epic Glimmer. Most of the album is atmospheric, symphonic rock, with Schenk not only taking the vocal duties, but also playing keyboards and bass synth. Schenk’s main instrument is the drums, but kind of like Phil Collins, he’s moved away from them a little in favor of expressing himself vocally, which is okay, because he has a fine, very smooth and melodic vocal style that works perfectly with this style of music, but...well, more on that a little later. On Nobody Cares, he uses programmed drums based on his actual drumming so he can focus more on his own song writing and the keyboards. And while I wouldn’t call Schenk a Rick Wakeman or anything, he more than aptly plays the keyboards to create deep layers of complex symphonic sound. It’s all enhanced by the excellent Gilmour influenced guitar work of Schenk’s long time collaborator and band mate Giova Esposito. Most of the songs are generally longer, in the 7 to 12 minute range, with a few shorter tracks, like the lovely Alan Parsons Project influenced Home Again. Full Moon’s Rising features some lovely flute playing from Milhena Zaharieva, and delves a bit into mid-period Genesis territory for a more upbeat number with nice arpeggiating keyboards. The only drawback to the album is how digital it is in nature. I think it suffers a little from sounding too smooth and programmed. Schenk even says in the liner notes that some may regret that he hasn’t played the drums on this album. I have nothing against programmed percussion, it can be quite effective sometimes, but I think some real drums might have benefited Nobody Cares a little by giving it a bit more of an organic feel. Especially when you have a drummer of Schenk’s reported talents at your disposal! But it’s a minor quibble. Nobody Cares is a fine symphonic progressive rock album that should please fans of the genre, especially fans of Eloy. 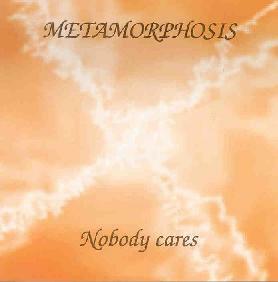 For more information you can visit the Metamorphosis web site at: http://www.jp-metamorphosis.com. Nobody Cares is distributed by Galileo Records. You can visit their web site at: http://galileo-records.com.